There’s an old saying about the seasons in Jackson Hole, “We get nine months of winter and three months of bad skiing”. Which would apply to most ski towns in the Rocky Mountains and the Western U.S. this year. Fact of the matter is, the first snowfall in the Teton Mountains came back on September 10, 2010, and it is now June 19, 2011, and still snowing at the higher elevations today. There is still about 10-feet of snow on the ground above 9500-feet in the Tetons, which means there might be more like only 1 or 2 months of bad skiing this year. (Current snowdepth map for the Central Rockies). The Summer Season officially begins on Tuesday, June 21st If all goes well, temperatures will crack 70 degrees by Tuesday afternoon, something that has only happened a handful of times this spring in Jackson. And, as if someone flipped a switch, it looks like the first week of summer will be warm and dry, with highs remaining in the 70's all week. Normal high temperatures for this time of year would be mid 70’s. The record high in Jackson on the Summer Solstice is 90 degrees, set back in 1994. This June so far, we have seen cooler than normal temps most days. There was that one weekend when we almost hit 80 degrees (June 5 & 6). But then it snowed in town on June 9th and the high was only 50 degrees (record cold max temp for that date). And it looks like it will be another well above normal precip month, as well. So, while we never really had a fall or a spring season, we can at least hope for a few weeks of summer this year. 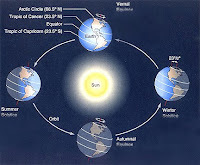 The exact time of the Summer Solstice on Tuesday June 21, 2011 is 11:16 AM MDT. This is when the sun will be directly over the Tropic of Cancer at 23.5 degrees North latitude. The Solstice also marks the longest day of the year in the Northern Hemisphere. But the days don't start getting shorter for about another two weeks, as the sunrise/sunset times do not change much around the Solstice. We will have almost 16 hours of daylight in Jackson the rest of the month -- not including twilight -- compared to less than 9 hours around the Winter Solstice in December. The graphic below shows the change in the tilt of the earth and its orientation to the sun, which is responsible for the seasonal changes we normally see. As you can see, in the summer, the northern hemisphere is tilted towards the sun. So, when the sun finally does appear from behind all the clouds, it will be as high in the sky as it gets around here, about 70 degrees above the horizon at noontime.